Parking in DC is neither cheap nor easy. Few are willing to pay the $25/day to park a vehicle in DC. If you'll need to play in this game, its better to know the rules and techniquest to park smart, and work with the system. This blog is a survival guide to DC parking. First consider getting one of these or parking in the city could lead to this. Rules: If you don't have a zone sticker for that parking zone, don't park here beyond the time limit indicated on the sign. You must leave the zone after fulfiling the time limit. Moving your car across the street (likely the same zone) or to another parking spot is not sufficient to avoid a ticket. In order to ensure that DC residents living in highly congested areas of the city are provided a parking spot close to their area of residence, the District has created a series of Parking Zones throughout the city. Residents in these zones are provided (at a high co$t) zone stickers that they must display in their vehicles, therefore indicating that they do not have to abide by the zone time limit restrictions. 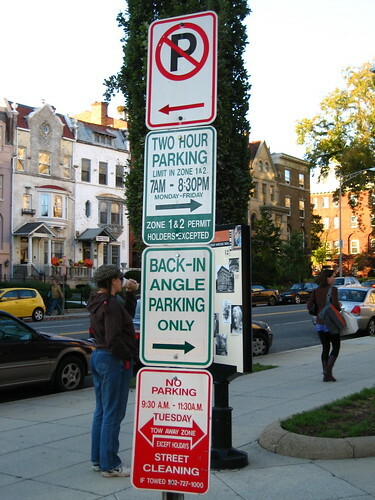 DC parking zones are generally designated by a number (Zone 1 - Duponte, White House area, Georgetown, Zone 1A - Adams Morgan, Columia Heights) and are indicated in street parking signs. Although zoned parking allows any car to park in that zone, the rules generally dictate a limited time frame that spans from 2 to 1 hour time limit. Although these zones are generally enforced less frequently than parking metered streets, they are definately not something to play around with. DC ticketing officers are vigilant and numerous. If you are in downtown DC area such as Georgetown, Duponte Circle or pretty much anywhere in the DC North West area, the residential parking is "Zoned." A zoned parking area generally means that those vehicles that do not have "zone permits" stickers on their vehicles can only park for a restricted time period. Generally this time period is 2 hours. Enforcement: It comes in waves! DC parking enforcement tends to enforce zoned parking by moving officers to one part of town every week and ticketing vehicles back-to-back. This penalizes violaters with back to back violations and therefore disuades them from attemtping to do long term parking in zone parking. However, it is tough to enforce thousands of vehicles and check their parking time every two hours. Parking Example: You arrive, pull in to a two hour spot. It is 12 noon. You move your car across the street at 2PM to avoid a ticket/the rule of 2 hour parking. This does not work. You cannot remain in the same zone for more than two hours. Best action is to move it to another street. The parking officers most likely pass by a street at say 12 P, and then return to harvest their tickets after two hours. Your odds of not getting a ticket are better if you move to another street, even though it may be in the same zone.